The Call Assistant SD reorder is a multifunctional voice recorder. This is the only recorder that comes with telephone line recording and handset recording. Easy-to-use telephone recording system that automatically records your telephone conversations. These conversations are stored internally to a removable SD card. It is battery-powered, and does not need to be connected to any other devices to record. This powerful recording device is only 5.75’’ x 2.75’’ x 1.5’’2.5”x4” small, so it easily fits next to your phone. You have the flexibility to play back the recording or transfer to a PC for playback and storage. 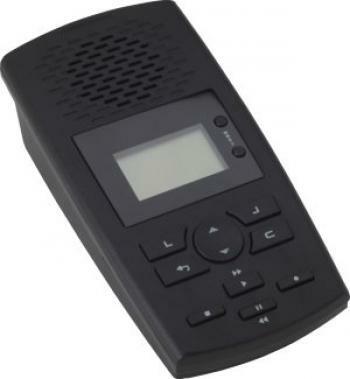 Secure digital Phone Recording Device , up to 330 hours of Phone Call Recordings on a 2gb memory card. Caller ID, digits dialed, time, date, duration and comments stored. Auto start/stop record using line current detect or voice detect. Supplied with Intelligent Recordingâ€™s world renowned XtR Desktop Phone Recorder Software for call search/playback and management on PC. The Call Assistant SD Telephone Recording Device connects directly to analog line or to digital/IP telephone handset cords. Large Backlit LCD displays all important call information and lists recent calls. Rapid search and playback controls. Playback Recording Calls via built-in speaker or headset socket for privacy (also via PC with Call Recorder Software supplied).